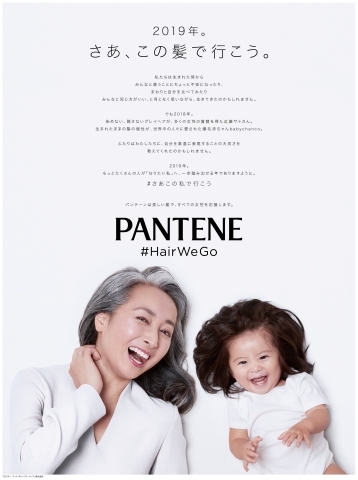 Pantene Japan Launched the Advertising Campaign “#HairWeGo My Hair Moves Me Forward” in a New Year's Newspaper on January 7th, 2019 Selected the First Ever Gray Hair and Baby Celebrities for Pantene Japan Adverting Ambassadors. Ms. Sato Kondo who Gained Respect and Admiration for Choosing to Keep Her Natural Grey Hair and a Japanese Baby Girl “babychanco” Known as Full Head of Voluminous Hair All Over the World had Taught Us the Importance of Expressing Our True Selves. KOBE, Japan--(BUSINESS WIRE)--Pantene Japan (Headquarters: Kobe City) launched the adverting campaign “#HairWeGo My Hair Moves Me Forward” in the Japanese national newspaper “Asahi Shimbun” on January 7th, 2019 featuring Ms. Sato Kondo and babychanco. Pantene Japan selected Ms. Sato Kondo who is the first ever gray hair advertising ambassador for Pantene Japan and Japanese baby girl called babychanco known as full head of voluminous hair all over the world who both attracted attention with their own style of expressing themselves through their hair in 2018. In 2019, let your hair move you forward. From the time we were born, we’ve lived our lives feeling a little anxious about being different and constantly comparing ourselves to others. Somehow, we grew up believing that it’s better to be the same as everyone else, without really understanding why. 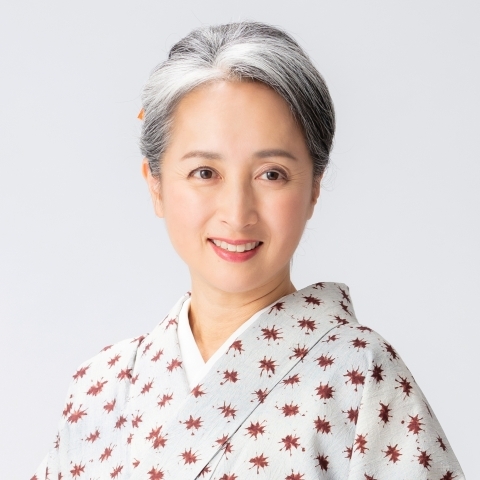 However, in 2018, Sato Kondo, who proudly lives without coloring or hiding her grey hair, won the admiration of many women. 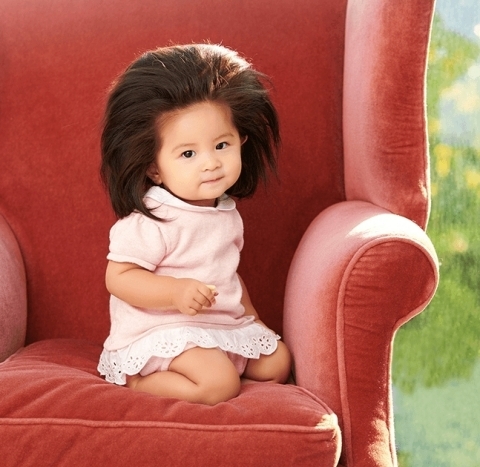 Japanese baby girl “babychanco” who has full head of voluminous hair, received love from people all over the world. In some way or other, these two may have taught us the importance of expressing our true selves. In 2019, We hope many more women will take a step forward towards who they want to be. Pantene Japan celebrates all women in taking that first step forward towards who they want to be. 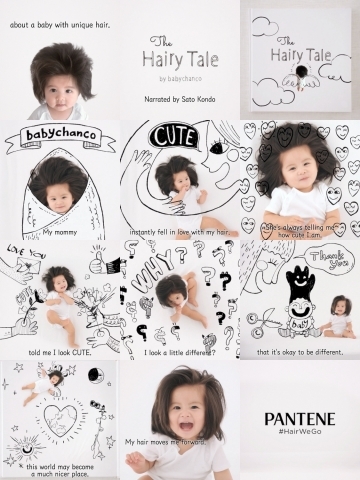 Pantene Japan sent the short movie titled “The Hairy Tale by babychanco #HairWeGo PANTENE” on December 23rd, 2018 which was the babychanco’s 1st year birthday. The movie features the memory of babychanco's one year from her birth who is well known all over the world as full head of voluminous hair. Looking back at her various hair episodes with our celebration greetings, the story encourages viewers to embrace their own individuality and difference. Pantene Japan has a philosophy "Great hair gives women the courage to take a step forward". We hope many more women will move forward towards who they want to be. Pantene Japan will keep supporting all women who step forward with their beautiful hair. July 11, 1968 born in Gifu prefecture. Started career from Fuji TV. Assigned many kinds of TV program such as information and comedies with her calm voice. As a special professor of the department of broadcasting at Nihon University College of Arts, teaching announcement practice, recitation, graduation research guidance from 2011. Born in Kyoto Prefecture in December 2017. She became popular all over the world when she was at the age of 4 months when her mother started post her pictures in Instagram at the age of 4 months. Her followers are over 300,000 in 7 months from first posting. Many of her fans are attracted not only her unique voluminous hair but also her prettiness. Shown with many of domestic TV medias and picked up in overseas magazine "People". Pantene Japan Launched the Advertising Campaign "#HairWeGo My Hair Moves Me Forward"